We love sharing buttons, and hope you’ll love our newest set of sharing buttons. They’re not only big and beautiful (meaning more shares) they are also responsive sharing buttons. We’ve developed several other widgets that are designed to be responsive to your site. You’re probably familiar with the Sharing Sidebar, the Follow Header and the Recommended Content Footer, all of which you can grab code for in AddThis Pro. The new responsive sharing buttons are slightly different: they’re inline, and can be placed anywhere in your layout. For instance, you can place them at the top and/or the bottom of your blog post. Or you can place them in the header and/or the footer of your site. And while they’re big and beautiful on a desktop, if you’re viewing them on a tablet or mobile phone, they’re are still beautiful, but they’re not as big. They are touch-friendly so users won’t accidentally click on the wrong social network to share to (creating a great user experience for them). If you want to test this out on a desktop, just re-size your browser to less than 1000px and you’ll see these buttons shrink down. And just like our other tools, you can specify the point where you want the desktop buttons to change to the mobile-friendly buttons. 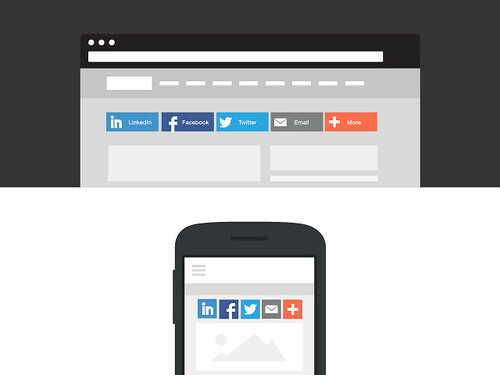 This means your sharing buttons will truly be responsive along with the rest of your site. Some sites may have media queries at 1000px where they change their layout and others might have media queries at 800px. Our responsive sharing buttons instead let you specify that value so not only your page layout changes, your sharing buttons will change to provide your visitors an optimal browsing experience on any device. Give these new sharing buttons a test-drive! Head to your AddThis Pro Dashboard if you’re already a Pro user, or upgrade quickly to AddThis Pro today. When’s the Best Day and Time to Post on Social Media? Copyright © 2019, Oracle and/or its affiliates. All rights reserved. Oracle and Java are registered trademarks of Oracle and/or its affiliates. Other names may be trademarks of their respective owners. Make your content shareable with just one click. Build your audience one fan at a time. Engage readers with your most popular content. Collect more emails and build your email subscriber list. Promote the right page at the right time with our tools. AddThis offers online tools that leverage data from our network of 15 million sites. We help publishers understand their audiences and drive traffic to what matters.